The story of how Isaac Newton, a lackluster student at the bottom of his class, became one of the most influential scientists in history. “If I have seen further, it is because I have stood on the shoulders of giants,” Newton said when asked how he could see and understand things that others didn’t. Galileo and Kepler were two of those giants, and a page is devoted to each in the course of this colorful treatment of the young scientist. Newton may have not been a stellar student, but he was interested in the world around him—the bloodsucking leeches and frogs’ livers used by the local apothecary, why apples fall down and not up or sideways, and why planets move. Lasky’s eye for the telling detail and Hawkes’ child-friendly illustrations capture the young Isaac Newton’s school days and his creative work during the bubonic plague and the Great Fire of London. 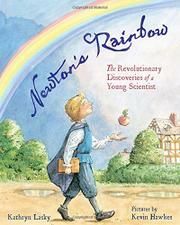 However, the pages are dense with text, and in trying to make Newton’s complex ideas accessible to young readers, Lasky occasionally resorts to textbook-speak: “He was already using the laws of motion, laws that he would later explain and that form the basis of modern physics.” Overall, though, text and art work well together to portray Newton’s curiosity and sense of wonder.